I woke up before the alarm at 4:30am. Fox kept right on sleeping as I rolled him off me, onto his back and quietly slipped out of bed. I swiftly changed into the clothes I’d laid out the day before, applied minimal make-up, popped some waffles in the toaster, and added a few last-minute things to my bag. As I was thinking of what to do next, I heard Fox waking up and dashed back into the bedroom. I found him sleepily sitting up in bed rubbing his bleary eyes. We snuggled and nursed before getting ready the rest of the way. I’d been concerned about how the early morning wake up would go for such a little guy, but it worked out even better than I’d hoped. Most of the drive to the airport went happily, with just a touch of fuss as we were nearing our exit ramp. He was intrigued by the sights and sounds of the airport. Luckily, there wasn’t a line at the check in counter and we had no luggage to check. We breezed through security, picked up coffee and a cookie on our way to our gate, and had just enough time to visit the restroom before they started boarding. Fox nursed during take-off and after a little reading and singing he was asleep. Russ leaned his head on my shoulder and fell asleep as well. There were a few tears upon descent when Fox didn’t want to nurse anymore, but some Cheerios got his ears popping again and all was well. Glad to get to skip baggage claim, we went straight for our rental car, giving Fox some time to dance to the car radio before putting him in his car seat and heading to my parents’ house. My family came out to meet us as we pulled into the driveway. It was the first time my brothers and sister got to meet Fox and I was super excited to see them all after being away for three years. A very happy reunion for all! 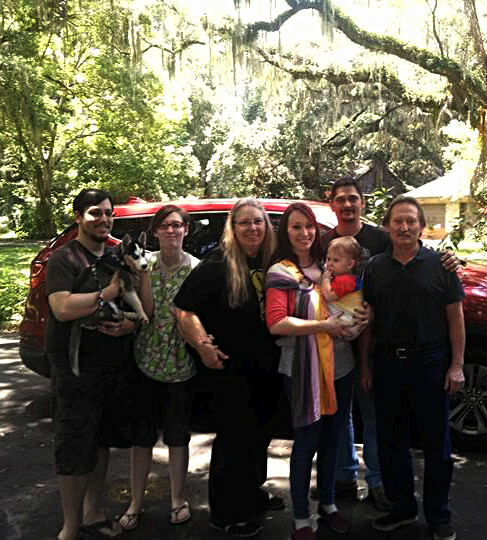 It was wonderful to visit with friends and family while showing Fox my hometown and my childhood home. My parents were charmed and impressed by Fox. So sweet to get to share him with them. Such a big trip for my little guy. Lots of firsts. First time getting up and going so early. First bus, plane, escalator, moving walkway, and flight. First time out of Indiana. First time meeting uncles, aunt, and great grand mother. Truly special. For our return trip I checked us in and printed our boarding passes from my parents’ house. That way we were able head straight to security. But while focusing on getting us where we needed to go, I forgot to empty my water bottle beforehand. My loving husband had to be escorted back to empty it and go through security all over again. Fox explored the terminal by our gate, walking and crawling around and making friends with a 10 month old little girl. I enjoyed chatting with her mom about traveling with a little one. Below are some tips based on our flight experience. 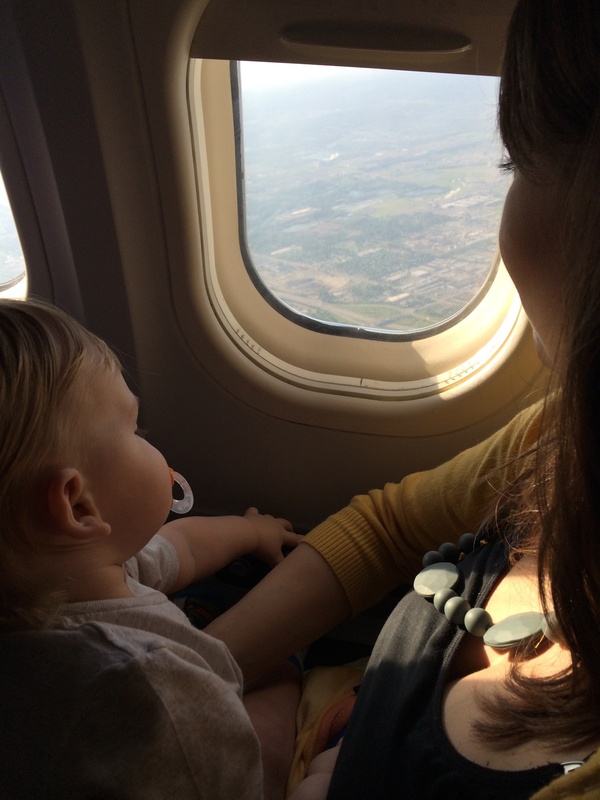 Hope they help make flying easier and more fun for you and your little one as well! Not only to keep them occupied and full, but to get them swallowing so their ears pop on the plane. Carry-on only if possible, even if it means doing some laundry at your destination. To keep up as much of your nap and bedtime routines as possible as well as entertain. I found them most useful in the car. More than you think you’ll need, to be prepared for flight delays. Try to swing it so that your little one is sleepy in the plane or car. Depending on how long your flight is and how they do in the car. (My little guy has a hard time falling asleep in the car, so I was aiming for him to sleep on the plane). Remember to empty it before heading to security. If not you’ll have to go back, empty it, and go through security again. You can usually check in online at the airline’s website and print your boarding passes. Having a sling or other type of baby carrier made it easy to move through the airport and helped our little one feel safe and comfortable in a new environment. Burrow and Bloom • This entry was posted in Family, Friends, Motherhood, Tips, Toddler, Travel, Trip, Visit and tagged family, flight, hometown, tips, toddler, travel, visit. Bookmark the permalink. ← We’re going on an adventure!